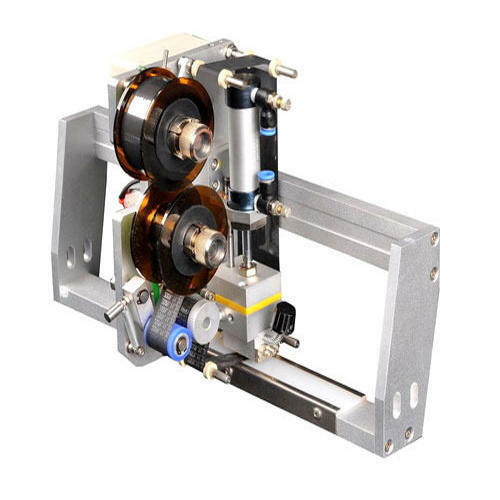 Compact Motorized Hot – Foil coder for Semi-automatic / Manual Table – Top registered printing of B.No., Mfg.Dt., Exp.Dt., M.R.P. Rs., Logos, etc. on labels, pouches, cartons, boxes, etc. or for Online registered printing on any intermittent FFS (Form Fill Seal), Oil / Milk Pouch Packing machine, etc. Model HFC-30-T. The 3-line message to be printed is easily composed by pushing the Brass Stereos into the grooves & tightening them. The inking is in the form of Foil ribbon, which passes below the stereos & is advanced automatically after each print. The brass stereos are heated to a temperature of around 150 deg. C & hit the film onto the substrate thus transferring the print with embossing.